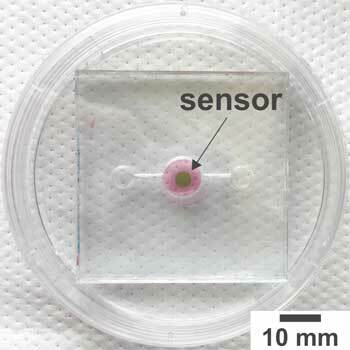 (Nanowerk News) A new biosensor allows researchers to track oxygen levels in real time in "organ-on-a-chip" systems, making it possible to ensure that such systems more closely mimic the function of real organs. This is essential if organs-on-a-chip hope to achieve their potential in applications such as drug and toxicity testing. The organ-on-a-chip concept has garnered significant attention from researchers for about a decade. The idea is to create small-scale, biological structures that mimic a specific organ function, such as transferring oxygen from the air into the bloodstream in the same way that a lung does. The goal is to use these organs-on-a-chip - also called microphysiological models - to expedite high-throughput testing to assess toxicity or to evaluate the effectiveness of new drugs. But while organ-on-a-chip research has made significant advances in recent years, one obstacle to the use of these structures is the lack of tools designed to actually retrieve data from the system. "For the most part, the only existing ways of collecting data on what's happening in an organ-on-a-chip are to conduct a bioassay, histology, or use some other technique that involves destroying the tissue," says Michael Daniele, corresponding author of a paper on the new biosensor (Biosensors and Bioelectronics, "Integrated phosphorescence-based photonic biosensor (iPOB) for monitoring oxygen levels in 3D cell culture systems"). Daniele is an assistant professor of electrical engineering at North Carolina State University and in the Joint Department of Biomedical Engineering at NC State and the University of North Carolina, Chapel Hill. "What we really need are tools that provide a means to collect data in real time without affecting the system's operation," Daniele says. "That would enable us to collect and analyze data continuously, and offer richer insights into what's going on. Our new biosensor does exactly that, at least for oxygen levels." Oxygen levels vary widely across the body. For example, in a healthy adult, lung tissue has an oxygen concentration of about 15 percent, while the inner lining of the intestine is around 0 percent. This matters because oxygen directly affects tissue function. If you want to know how an organ is going to behave normally, you need to maintain "normal" oxygen levels in your organ-on-a-chip when conducting experiments. "What this means in practical terms is that we need a way to monitor oxygen levels not only in the organ-on-a-chip's immediate environment, but in the organ-on-a-chip's tissue itself," Daniele says. "And we need to be able to do it in real time. Now we have a way to do that." The key to the biosensor is a phosphorescent gel that emits infrared light after being exposed to infrared light. Think of it as an echoing flash. But the lag time between when the gel is exposed to light and when it emits the echoing flash varies, depending on the amount of oxygen in its environment. The more oxygen there is, the shorter the lag time. These lag times last for mere microseconds, but by monitoring those times, researchers can measure the oxygen concentration down to tenths of a percent. In order for the biosensor to work, researchers must incorporate a thin layer of the gel into an organ-on-a-chip during its fabrication. Because infrared light can pass through tissue, researchers can use a "reader" - which emits infrared light and measures the echoing flash from the phosphorescent gel - to monitor oxygen levels in the tissue repeatedly, with lag times measured in the microseconds. The research team that developed the biosensor has tested it successfully in three-dimensional scaffolds using human breast epithelial cells to model both healthy and cancerous tissue. "One of our next steps is to incorporate the biosensor into a system that automatically makes adjustments to maintain the desired oxygen concentration in the organ-on-a-chip," Daniele says. "We're also hoping to work with other tissue engineering researchers and industry. We think our biosensor could be a valuable instrument for helping to advance the development of organs-on-a-chip as viable research tools."